I’ve been working overtime on making jewelry this week. The holiday shopping season started early for me and my online orders have been picking up. I needed a break from jewelry today so I got out the sewing machine. Bikeman went through his closet a few weeks ago and made a pile of clothes to take to Goodwill. I really liked a few of the shirts and I hung on to them. 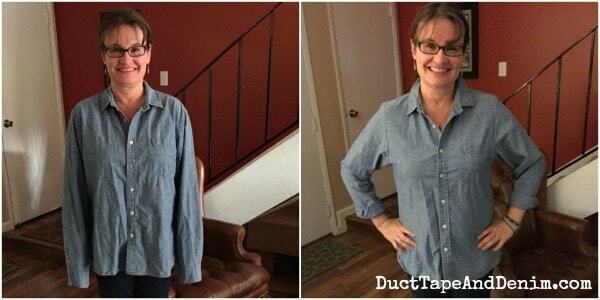 I’ve seen a few tutorials on Pinterest that showed how to alter a man’s shirt to fit a woman so I thought I’d try it. The first problem I faced was the shoulder seams. The shirt seam was a couple of inches past my actual shoulder. I started by stretching out the man’s shirt on my table and laying one of my shirts over it. I used chalk to mark where I should cut. My photos didn’t turn out all that great. 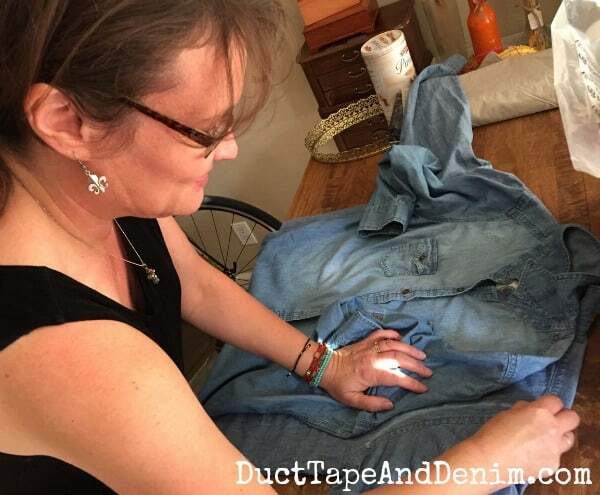 I used one of my chambray shirts to measure and blue chalk. I wasn’t thinking about how everything would show up in a photo… I just got a lot of blue! I cut along the chalk mark at the shoulder. Then I measured the sleeve against my shirt’s sleeve and cut off the extra. Next I marked the side seams the same way, sewed them up, and trimmed away the extra. Then I just set in the sleeves like I would if I was making it from scratch. There was a lot of extra volume in the sleeves, too, so I trimmed them down along the seam, too. I didn’t change the cuffs — just moved the buttons. I usually wear my sleeves rolled up so that didn’t matter to much to me. Follow my DIY | Sewing board on Pinterest if you’re interested in more sewing projects. A special thanks goes to my hubby who photographed this project with his brand new iPhone 6+. Just the tute I’ve been needing! Men’s shirts are so much better quality than women’s tops in the same price range. I’ve been living with shoulders a bit long, but now, maybe I can make ’em fit. It’s amazing that I tun up the sleeves and the quality of my $25 shirts is so good, men complement me on them! Oh goodness, I used to do all the different alterations to clothes, and loved wearing mens shirts especially a good stripe on. But I have not done this kind of thing for over 20 years. Gees where did that time go. That turned out really nice! Thank you for linking with Home Sweet Home! How creative! My hubby is really tall and has long arms. 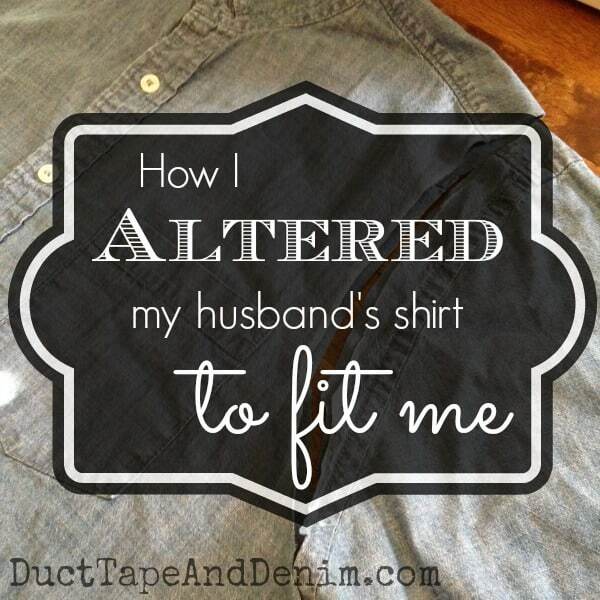 I would have to do a lot of altering to fit me. lol! Thanks for sharing with SYC. What a great idea! I’m going to be raiding our donation bin for sure! Thanks for linking up at The Creative Circle! I hope you’ll join us again this week! Love your ideas on jewlery making but I also enjoy sewing gifts for family members.